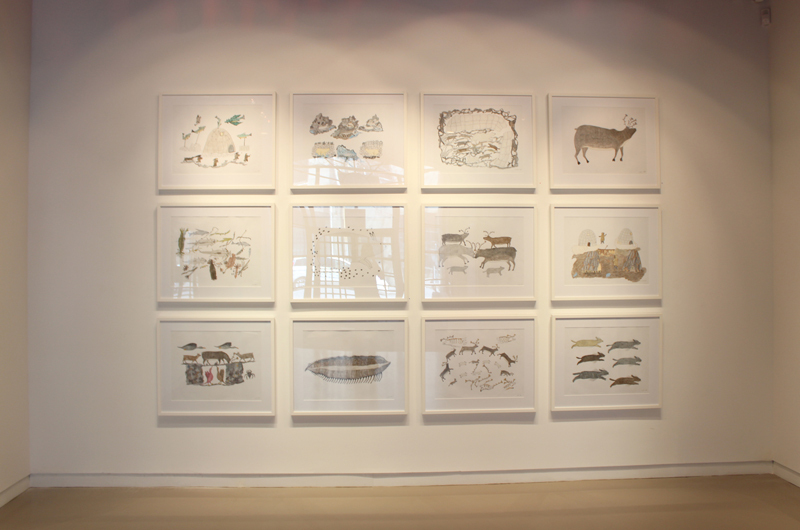 The renaissance in Inuit drawing has been the largest development coming out of the hamlet of Cape Dorset in recent years. Historically the print release was the economic engine of the co-operative, an operation that began in the late 1950s and continues to this day. Drawings were the source for the output of prints that has shaped the artistic product of the arctic for decades, seldom existing as an art practice of its own. In recent years however, drawings have been the face of the presentation of the north to the south. 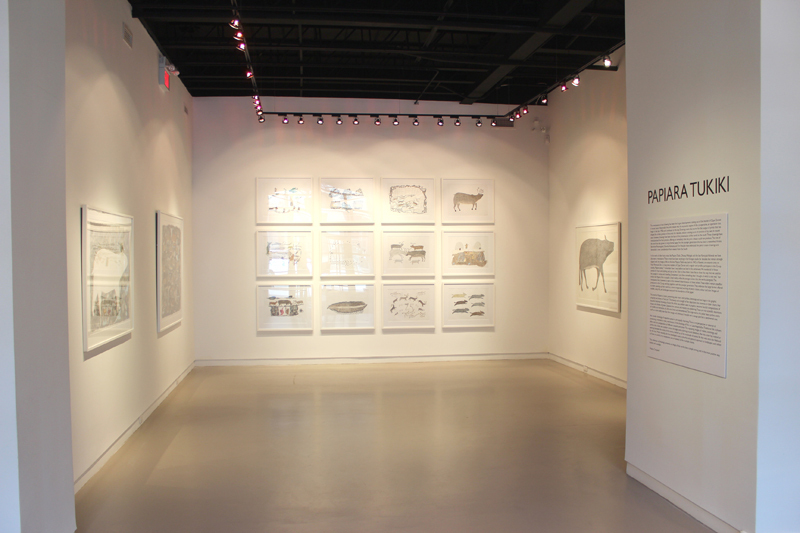 These drawings have revolutionized the Inuit practice, offering an immediacy that the print release could not produce. The size of the work has also grown to large format paper. For the younger generation this has been a watershed. Artists like Annie Pootoogook, Shuvinai Ashoona and Tim Pitsiulak have embraced the pencil crayon drawings and demanded a new consideration from viewers from the South. In the work of elder Inuit artists like Papiara Tukiki, Ohotaq Mikkigak and the late Kenojuak Ashevak we have also seen a renaissance. These artists have been working in the Kinngait studio for decades but remain strongly aligned with the images of life on the land. Papiara Tukiki was born in 1942 at Nuwata, an outpost camp on Foxe Peninsula. 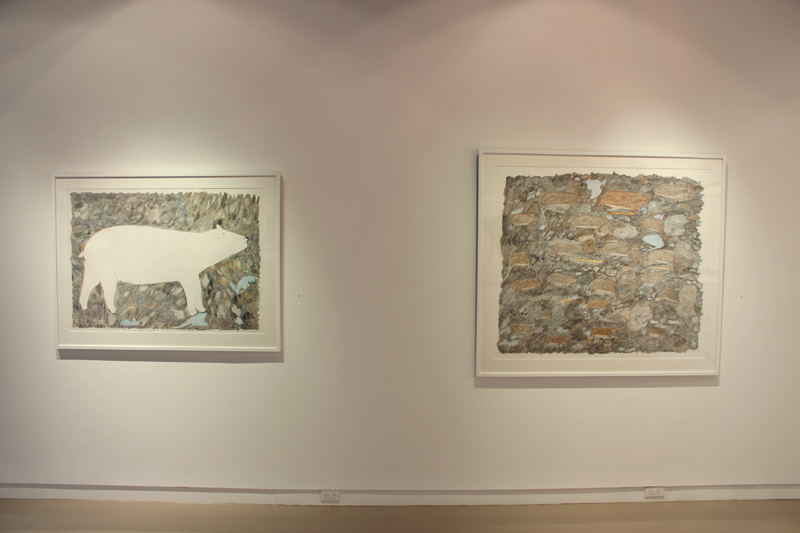 She is a long time resident of Cape Dorset and a regular and prolific participant in the Co-op studios. Papiara states, “I remember how it was before we lived in the settlement. We needed all of these animals for food and clothing and just to live. I like to draw them. I also like to draw the way that we used to live, people in camps and travelling. Sometimes I just draw something that I thought of which is not real.” For artists like Papiara this is actually a lived reality unlike the younger artists that she works alongside. The renaissance here, however, is seen in the renewed determination of these artists. These elders remain steadfast producers in the Co-op, working together with the younger generation. They embrace the large format offered to them, opening up their work to a more invigorated working of pencil crayon, colour and size. Images of wildlife, camp life, and landscape now push the boundaries of the paper. 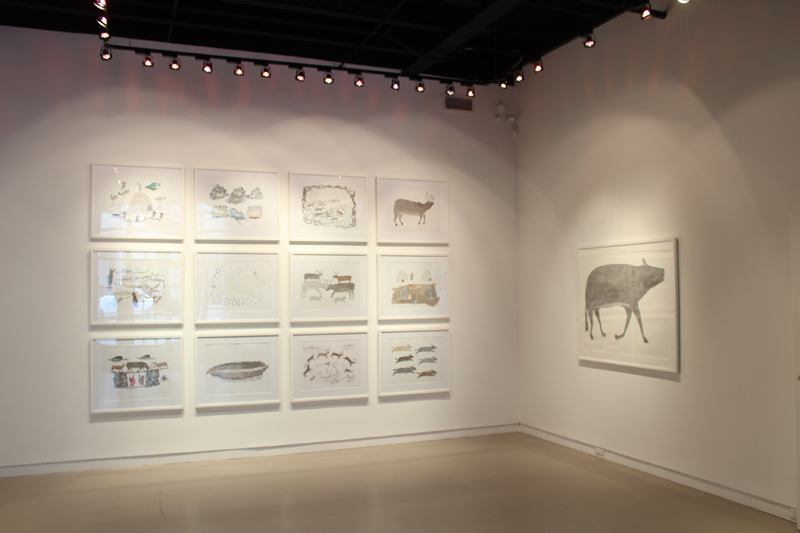 The work of Papiara is iconic, presenting polar bears and caribou, lemmings and sea bugs, in the graphic simplicity we know as “Inuit art”. The beauty and strength of her depictions lies, however, in their charm. Her beautiful botanical drawings of plant life of the sea, seldom seen in graphics, become fanciful compositions of shapes and shades of green. Likewise, her animals and insects are endearing. These are not scientific depictions of wildlife but memories of a life once lived and remembered. The large works of a polar bear, caribou and a wolf are more teddy bear-like than savage and ominous. It recalls not a savage past but a sentimental one. Her smaller drawings of repetitive patterns are equally charming. There is no perspective or attempt at presenting a moment in time, reminiscent of the drawings of Parr or Luke Anguhadluq. Traditional life is shown, often with the juxtaposition of different seasons and times. 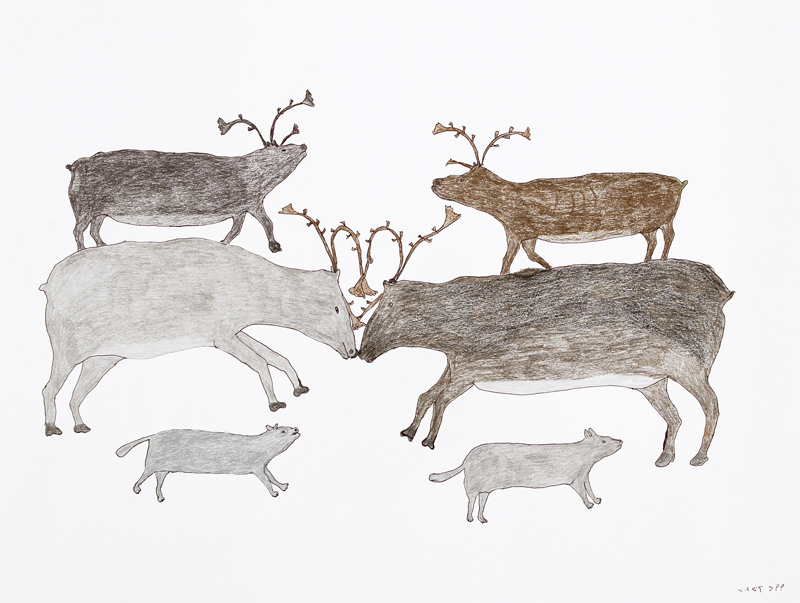 The repeating images of rabbits, lemmings and caribou that chase one another across the page, some skirting around skeletons after the snow has melted or weaving between the rocks of the tundra, remind us of the multitude of animal life that was once the lifeblood for the Inuit. More recently, she has developed a very colourful and gestural approach to landscape, used either to frame an animal or to emphasize one or several of the multiple scenes. This collection of drawings presents an image of the north that is simple, strong and in the most positive way, tender and nostalgic.